BrandChamp comes with a customizable Application Form which lets people apply to your ambassador program. 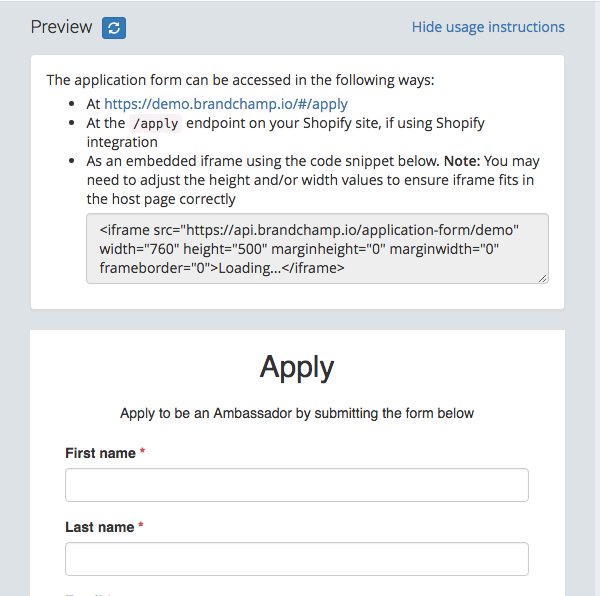 If you are using Shopify and have set up the Shopify integration and followed the steps to configure the BrandChamp app in your Shopify store, then your application form will be available under your Shopify website at an address like https://your-store.com/community/ambassadors/apply (the exact address depends on the configuration choices you've made - see the Shopify integration guide). If you are not using Shopify, or don't have that integration step complete yet, then the application can still be accessed by visiting your base BrandChamp portal web address followed by "/#/apply". Before we can register a BrandChamp, we need to take a moment to enable a "system email" so we can receive our registration link. You can hover over the small "?" symbol to get more information on each and click the Edit Template to customize the content. Each template contains some basic content out of the box which you can customize at any point but for the sake of this walkthrough, let's just accept the standard text. The most important System Email is the "Applicant accepted" one. This is sent when an admin marks an applicant as approved for entry into your program. It contains basic getting started info as well as the registration link for the BrandChamp, which we'll need for following steps so ensure the "Applicant accepted" system email is enabled (click the checkbox beside it). Ok so let's use the application form to apply to your ambassador program! Visit the application form via one of the means described above and complete the details for a test ambassador which you'll use from now on to explore the BrandChamp side of the system. Note: you will need to choose a different email for the ambassador to the one you use for logging in to the admin site. Click Apply. If you have enabled the "Applicant applied" system email previously, then once you click apply, you will receive that email from the system. Based on the information here, you can make a decision as to accept or reject the applicant from your program. Depending on which decision made, either the "Applicant accepted" or "Applicant rejected" system email will be sent. Let's accept our first applicant. Click the "Approve" field to "Approve" and ensure the "Send approval decision email now" checkbox is enabled. Note: if the decision email checkbox is disabled it's because the "Applicant accepted" system email has not been enabled yet. See the section above on how to enable that. Click "Update Applicant" to approve them and send the email. You will receive an email from the system which will include the registration URL. 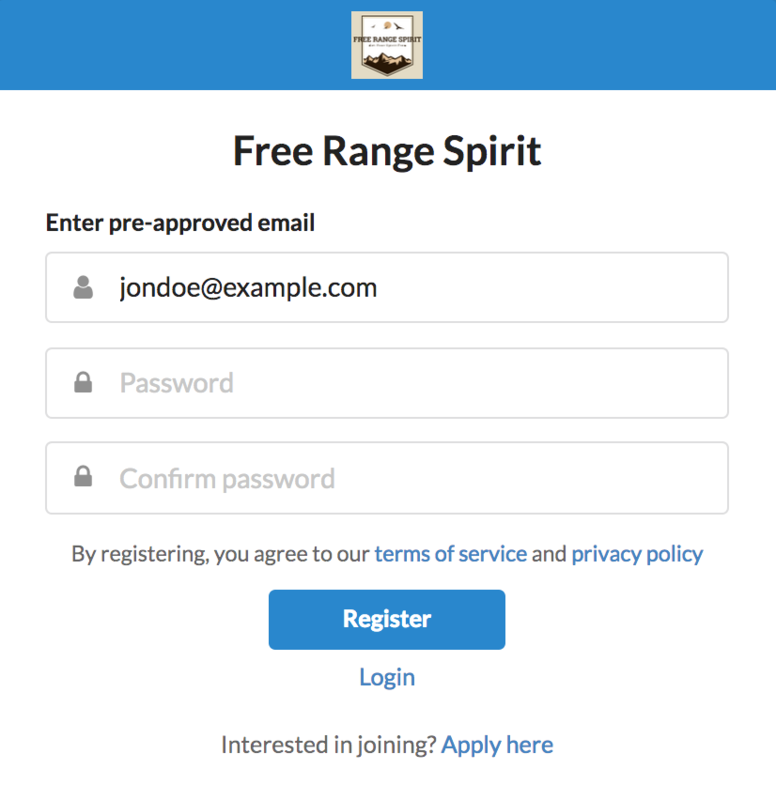 Note: If for some reason you can't access the email, you can also just click the "Register" link at the standard login screen for your portal. If someone attempts to register as a BrandChamp using an email which is not linked to a pre-approved BrandChamp, they will receive an error message telling them they must apply. I.e. only people who have applied and been accepted can register as a BrandChamp. Once you log in to the BrandChamp portal, you'll be prompted to complete your profile after which you'll see the main Activities area. Not much there for now! Let's learn how to create some Activity Types in the next walk through. When you register, the system will log you in as a BrandChamp which means you'll no longer be able to access the admin side. You will need to log out of the BrandChamp account first and log back in as an admin to access the admin portal. To see how you can log in as both at the same time, see the following article: Log in as Administrator and BrandChamp at same time.